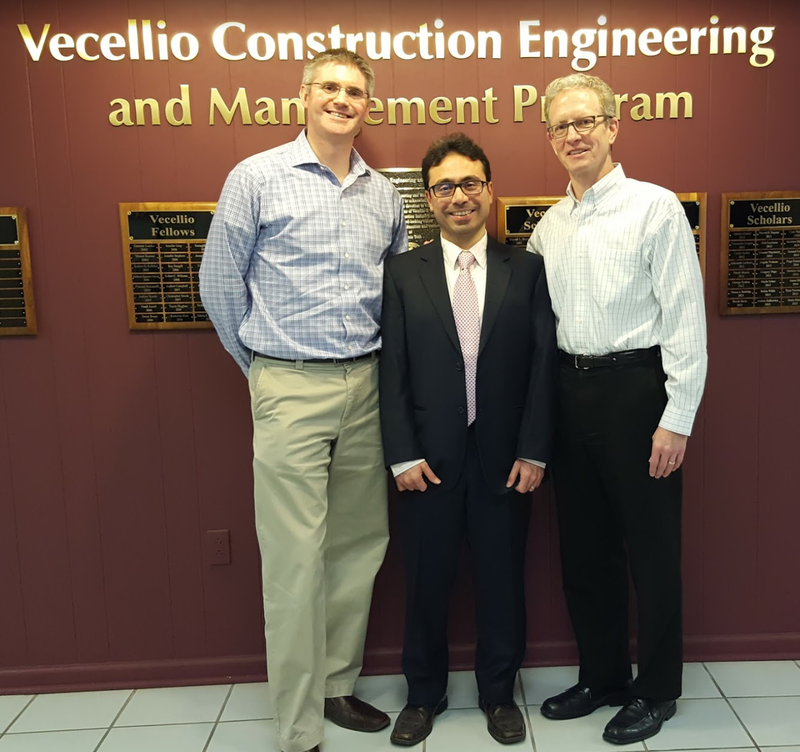 Congratulations to Behshad Ghadimi who successfully defended his PhD in Civil Engineering today. Behshad’s researched focused on the impact of project delivery methods on stakeholder issues and involvement practices in megaprojects. I served on Behshad’s PhD committee with Michael Garvin (Committee Chair, shown on the left below), Sunil Sinha, and John Taylor. The abstract to Behshad’s dissertation is provided below. As the scale and scope of infrastructure projects have increased, so too has the array of stakeholders either involved or impacted. Such projects often take years to come together and evolve with time through the actions of project sponsors and the engagement of various stakeholders. Stakeholders through engagement and input can help legitimize and improve large-scale project initiatives. Stakeholders can also marshal opposition that can delay or block these projects. Consequently, the significance of stakeholder involvement is critical in megaprojects. Governments have increasingly utilized public-private partnerships (PPPs) for megaproject delivery. This method introduces characteristics that distinguish PPP megaprojects from others such as: private control, profiteering, foreign profits, and long-term concessions. This study investigates whether differences exist between PPP and non-PPP megaprojects with respect to stakeholder involvement strategies and stakeholder issues raised in such projects. The research employs a longitudinal multiple case study approach that examines four tolled fixed crossing megaprojects; two of them are delivered as PPPs and two are delivered as design-build (i.e., non-PPP). The approach follows the design of prior studies in this area by De Schepper, Dooms, and Haezendonck (2014) and Winn (2001). Pre and post milestone event analysis captures trends and shifts in involvement strategies and stakeholder issues. Subsequently, stakeholder issue tables (organized by issue themes) and stakeholder mechanism tables (organized by mechanism type and information flow) are utilized for across case synthesis and comparison to identify similarities and differences among the cases. Analysis of stakeholder involvements across cases shows that NEPA establishes a baseline for involvement, but its requirements are not sufficient for megaprojects; a more comprehensive strategy is necessary. Further, although participatory involvements may enhance input and legitimize projects, these mechanisms must be carefully managed in terms of process and criteria for evaluating stakeholder input. Examination of stakeholder issues indicates that issues that are common to non-PPP and PPP projects are more prevalent than PPP specific issues. In particular, issues related to tolling are dominant; moreover, toll affordability is extremely sensitive, and its severity is predictable based on affected area demographics and past toll escalation practices. The study provides insights about how megaprojects are shaped through actions of project sponsors as well as impacted and interested stakeholders. It also demonstrates how these projects become artifacts of aspiration for politically powerful figures. Lastly, it identifies the main stakeholder issues and suggests a set of guidelines to assist future practitioners in developing better stakeholder involvement strategies, which should both enhance and legitimize megaprojects.